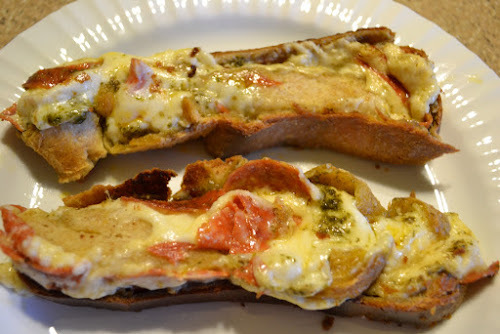 Over at Julie's: Pepperoni Bread ~ Over at Julie's Style! 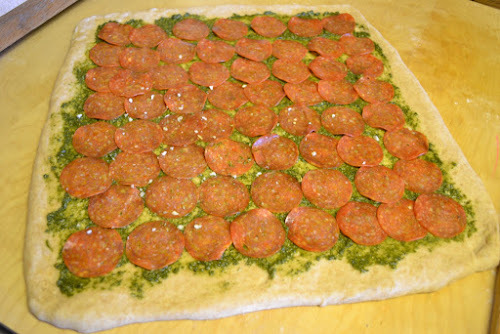 This morning, as I was kicking back reading my emails, I found a fun, how-to video on Allrecipes.com for making pepperoni bread! Since I already had honey wheat roll dough rising in the bread machine . . .
. . . the gears in my head started turning and I decided to pull out all stops and make my own take on this lovely pepperoni bread concept! 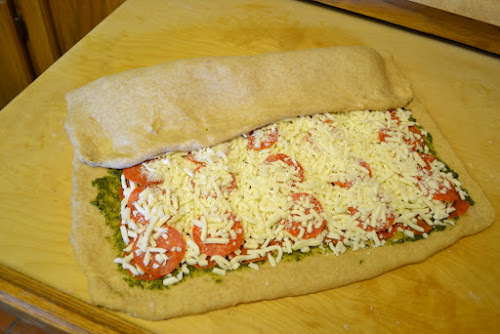 Basically, you will need bread dough. 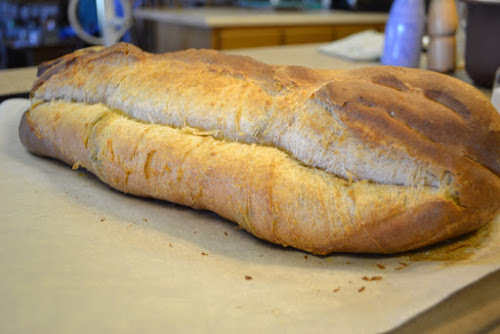 'All Recipes' recipe used a 1 pound, store-bought bread dough. My dough was made with 3 cups of flour, so, I reckon my dough is 1 1/2 pounds. The ingredients I used will be for a 1 1/2 pound dough ball, but it's easy enough to adjust recipe for a smaller dough ball. 3/4 cups of pesto, I thawed out a cup of my homemade walnut and basil pesto from the freezer. Line large baking sheet with parchment paper, and set aside. 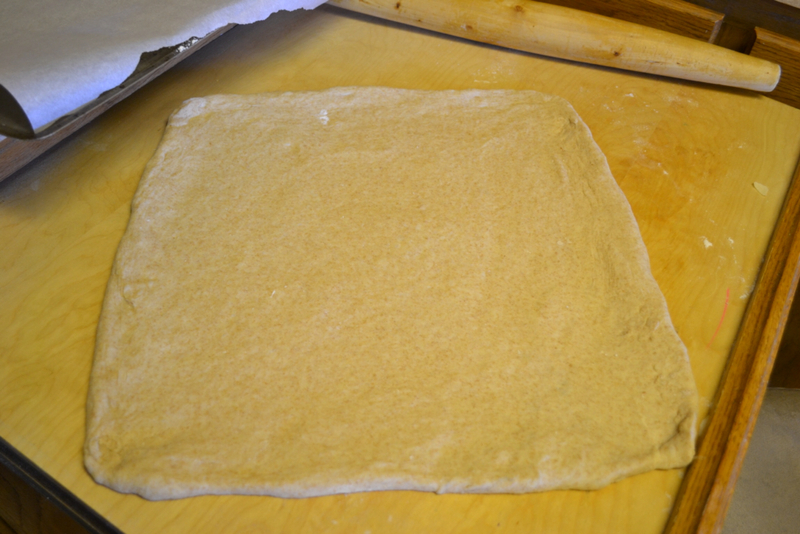 Begin with bread or roll dough, either homemade or store bought. Lightly dust board with flour and roll out into a rectangle (aprox. 15" x 16"). Spread a thin layer of pesto sauce on dough, leaving about a 1-inch border around the edges. 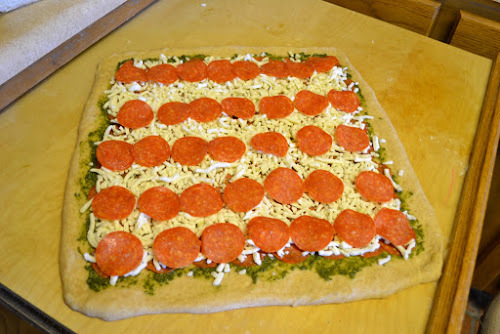 Sprinkle with a layer of mozzarella and more pepperoni. Sprinkle with a final layer of mozzarella. This is where, after making and eating my Pepperoni Pesto Bread Rollup, I would do things differently next time around . . . 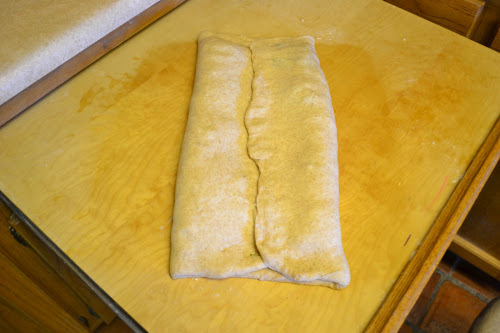 I would roll my dough up like a jelly roll the next time I make my Rollup, and tuck the short ends under sealing it all with a bit of water. This go-round, I folded my Rollup in thirds, towards the middle. With a pastry brush, lightly dampen folded over edges with water, to seal, brush edges all around the border lightly with and . . . 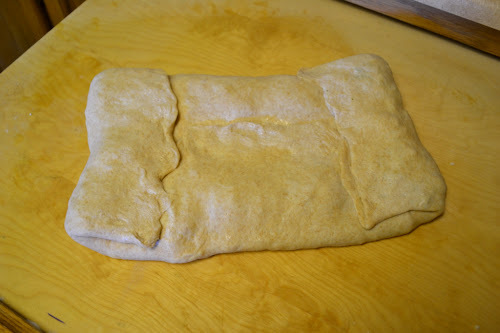 Fold dough in half, working the dampened dough together with fingers. Transfer to parchment lined baking sheet. 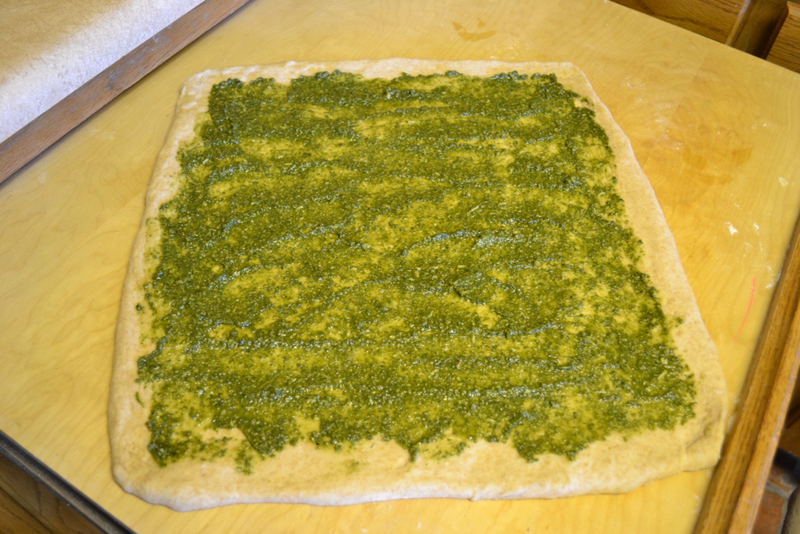 Drizzle with olive oil and using a pastry brush or hands distribute the oil to cover top and sides of loaf. 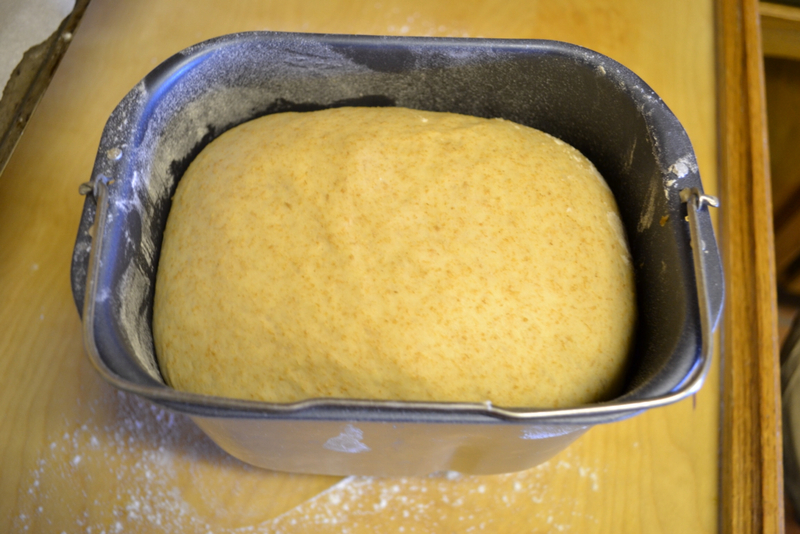 Place loaf in a 375F. oven. and bake for 40-45 minutes, until golden brown. Cool for 5 minutes before slicing. Now this is a meal! The hard part is waiting the 5 minutes for the "cool down"! I had just cut into my Bread Rollup when . . . The Federal Express man knocked on our back door delivering a package. He said, "Something sure smells good!" I told him I had just taken my Pepperoni Pesto Bread out of the oven and asked if he might like a "piece to go"? At first he politely declined . . . But the aroma was more than he could bear, and while I was signing for the package, he had a change of heart! I cut him a big slice! He left with smile, and I may have made a new best friend! I love it when unexpected "guests" show up, and I am just pulling something wonderful out of the oven! I knew pepperoni with lots of gooey melted mozzarella would taste wonderful, but adding a layer of pesto? Sheer genius! It really takes this over the top! 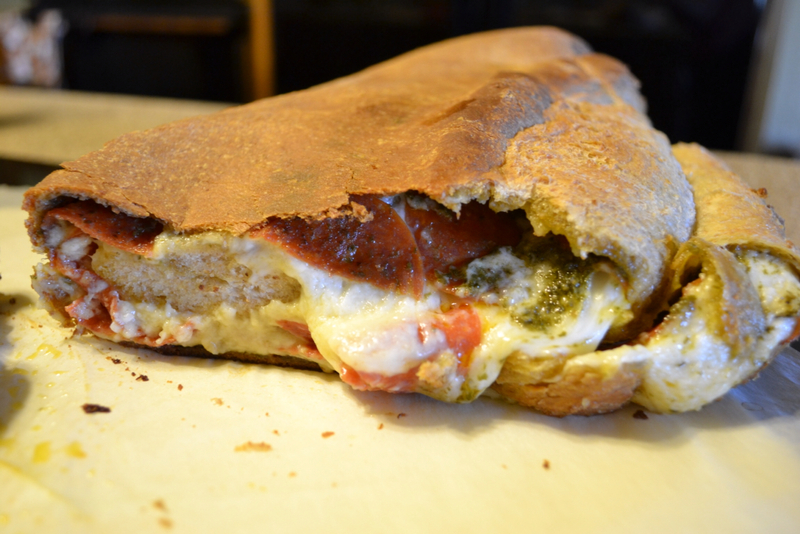 Soft nutty whole wheat bread inside, crispy crust outside, and the bottom crust is both crispy and flaky! 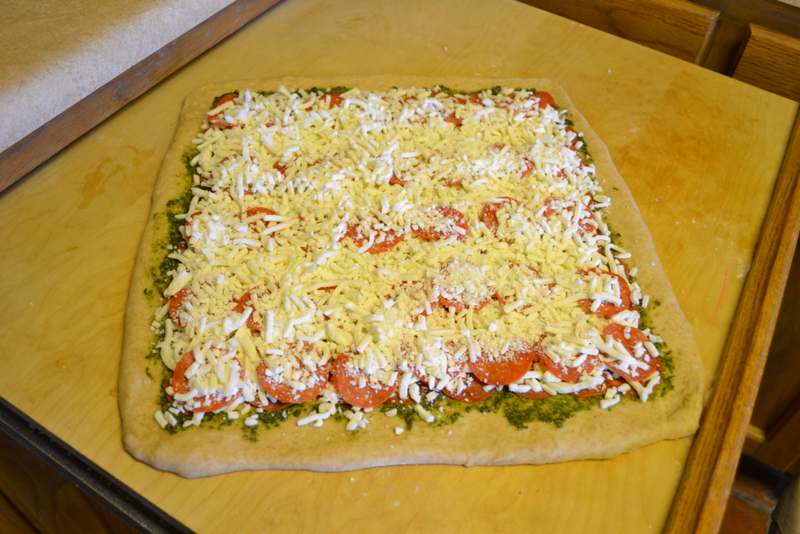 The totality of this simple bread dough, pesto, pepperoni and cheese is altogether incredibly wonderful! 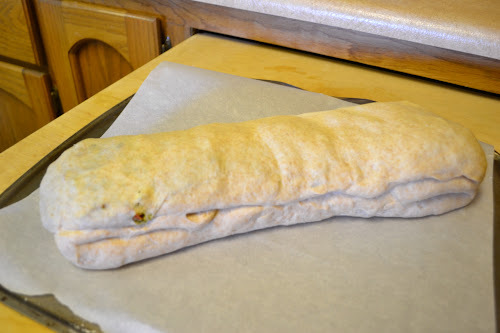 Funny, I started out this morning just making up a batch of hoagie buns and ended up with an extraordinary new creation, that will definitely become one of our regulars here . . . Over at Julie's!!! P.S. ~ This was super easy to make!